Note: this recipe is not low-fat. I repeat: This recipe is not low-fat. So, if you’re on a diet, thinking about going on a diet, or just got off of a diet, this is not the recipe for you. 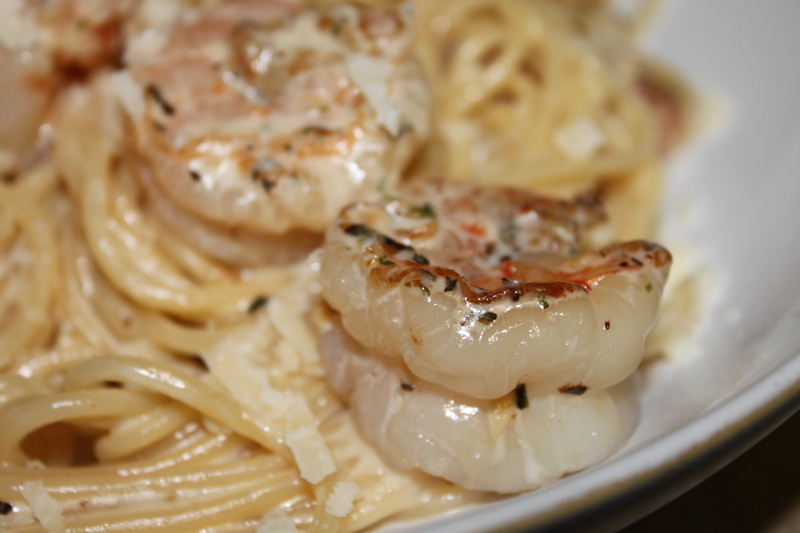 However, if you like restaurant-style seafood and pasta, and like to splurge every once in a while, then this IS the recipe for you. I make this lovely recipe when I have many people over to help me eat it, or it’s a special occasion. In my previous post, I said I made this dinner for Valentine’s Day and I’d post the recipe. Well, I didn’t want to disappoint my faithful readers, so here you go. You will need one pound of shrimp, any size. I like large, but use whatever you enjoy. Make sure the shrimp is deveined and the shell discarded. (I forgot to take a picture of that. 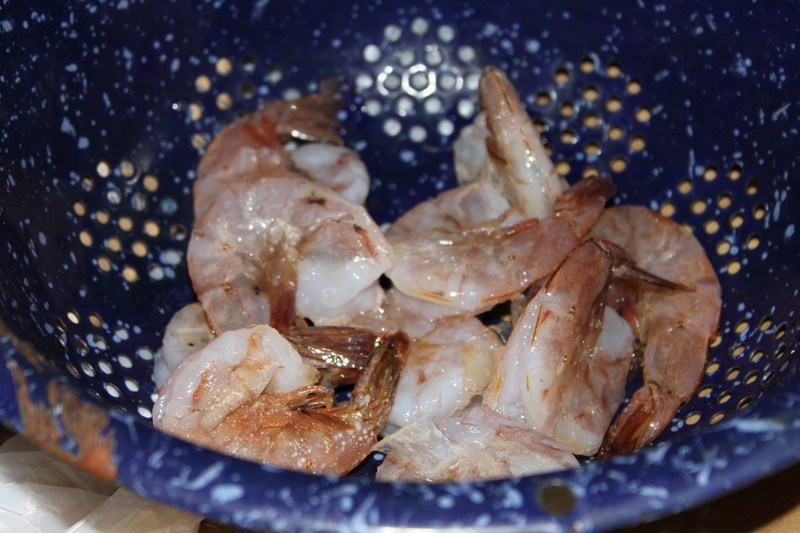 This batch of shrimp is deveined, but you can see the shells are still on.) Rinse and drain. 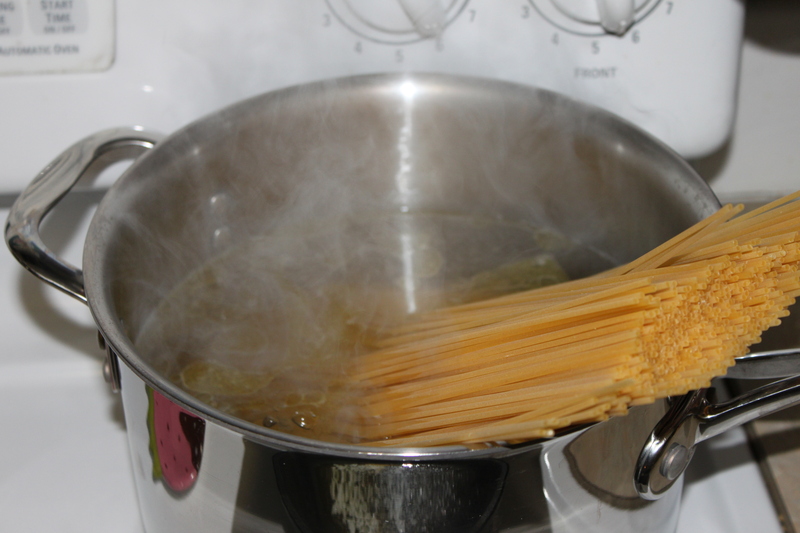 Cook one box of linguine or spaghetti noodles in a pot of boiling water. I like to add some olive oil or salt to the water to keep the noodles from sticking together. 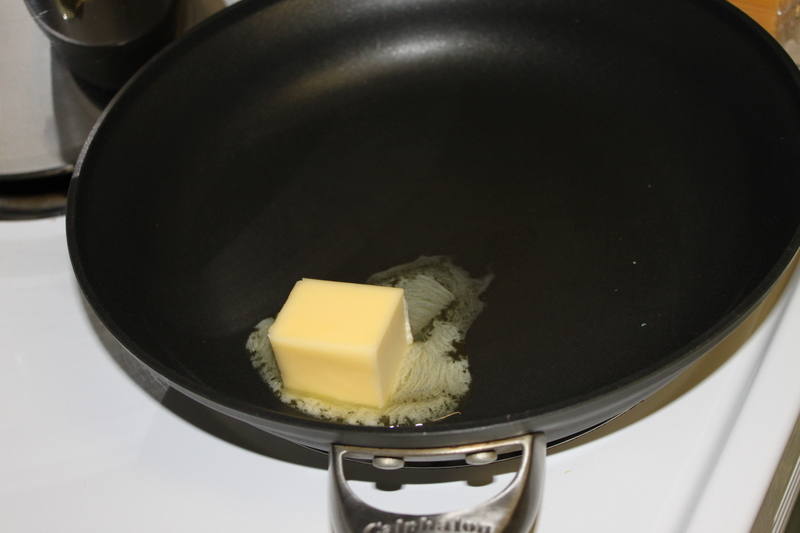 In another skillet, while the cream is warming up and the pasta noodles are cooking, heat 1/4 cup of butter in a large saucepan. 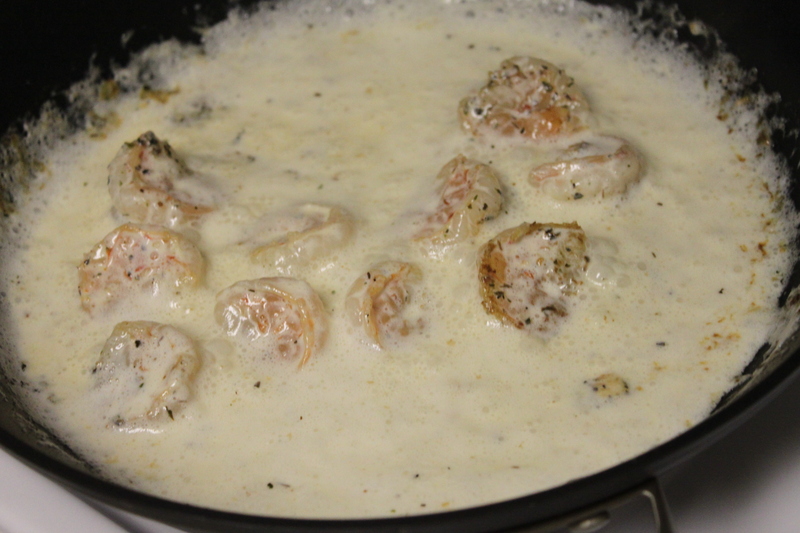 Add the shrimp, and the following ingredients: garlic, parsley, basil, thyme, and pepper. 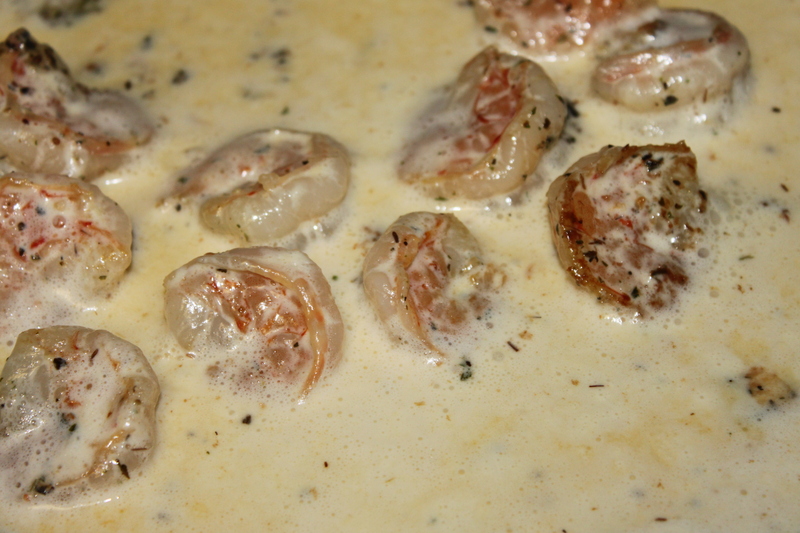 Cook until pink on one side and then flip over and cook until it is pink on the other side and the whole shrimp is no longer grey. 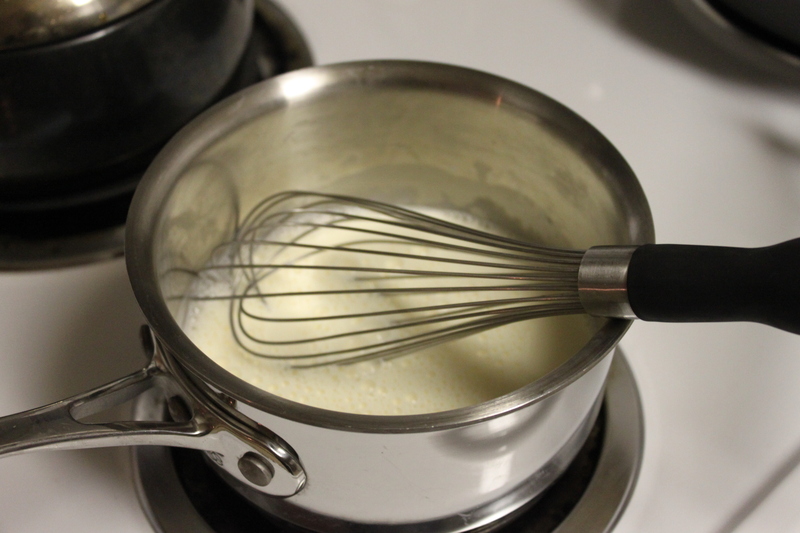 Add the heavy cream and stir to blend. Remove from the hot burner. Mmmm, doesn’t that look good? 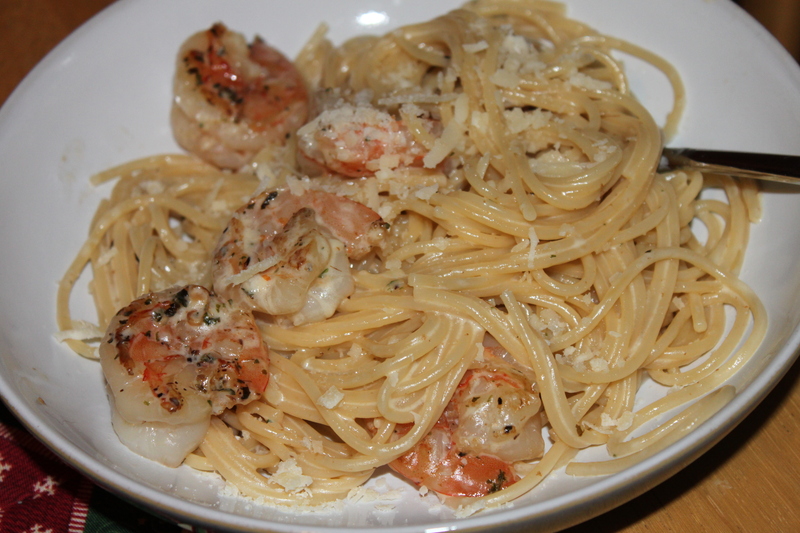 Pour the sauce into a large serving bowl, and then drain the pasta noodles, adding them to the serving bowl. Mix it together with some Parmesan cheese. 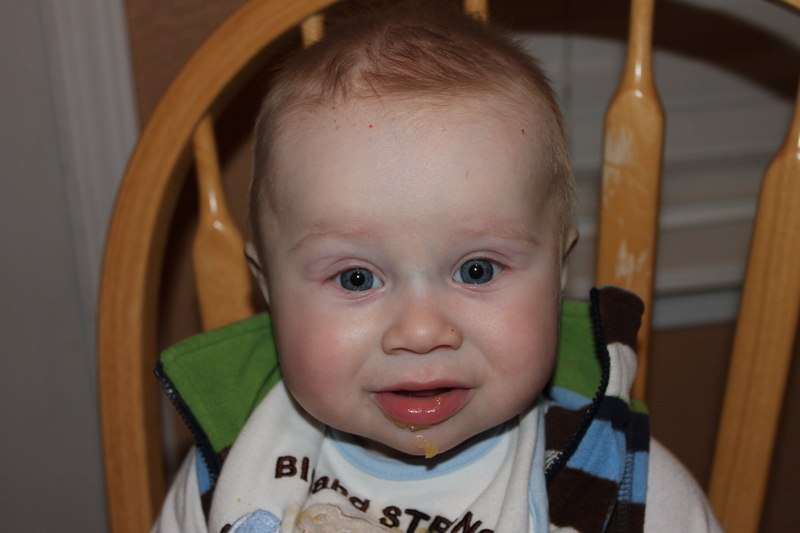 It was so good that Matthew really wanted some, but since he’s not a year old, he could only have his homemade applesauce. He didn’t seem too happy about that. 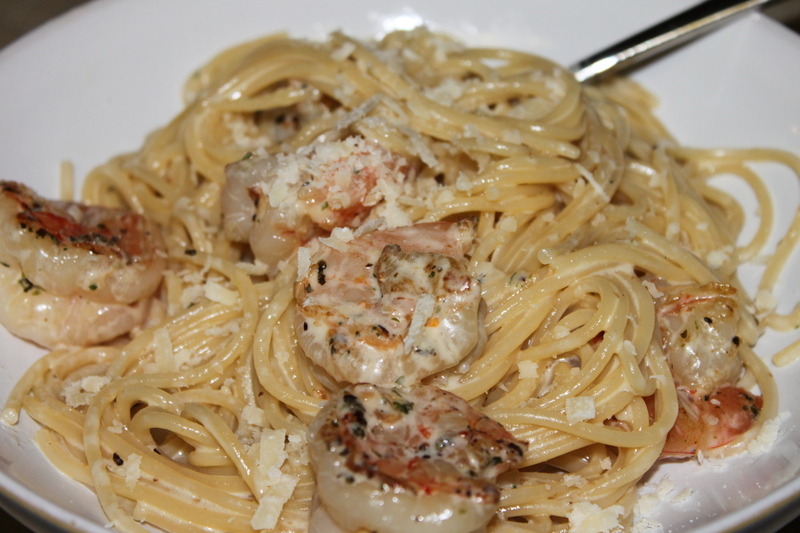 6 quarts water–bring to boil; add 2 T salt and 1 pound linguine. Cook according to package directions. 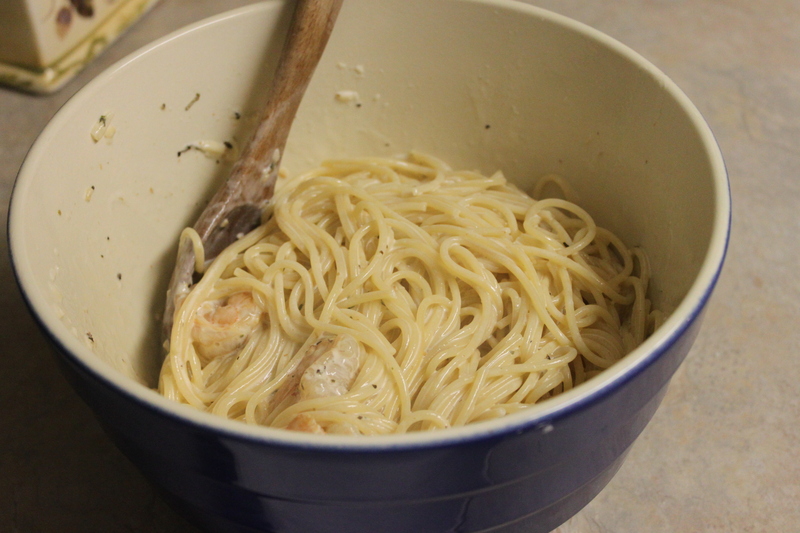 While linguine cooks, slowly heat heavy cream in a saucepan until it’s hot. Don’t boil! Stir frequently. 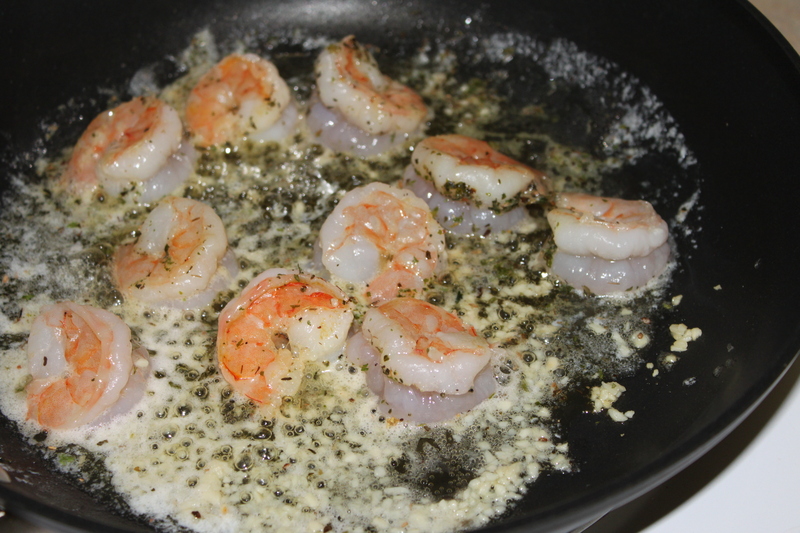 In another saucepan or skillet, melt the butter; add the shrimp, garlic, parsley, basil, thyme, and pepper. Add the hot cream. Stir to blend and remove from heat. 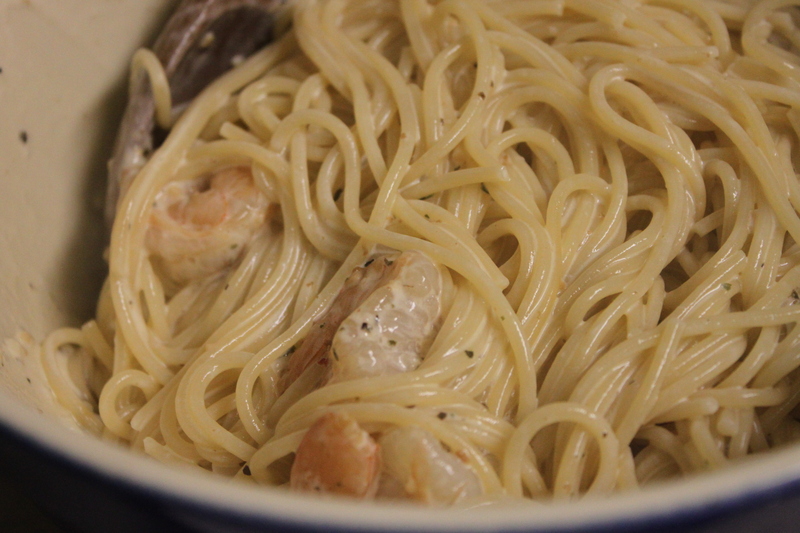 Drain the linguine and pour noodles onto serving platter or bowl. Add the sauce and toss. Add the cheese. Toss again. Serve immediately.